Described as ‘a tall, spare man, clean-shaven and with a clear, keen eye’, Knox was a sportsman and amateur naturalist, hunting, shooting, hawking, stalking and fishing as the seasons allowed – in the process building up a notable collection of Sussex birds. As a close friend of the Duke of Richmond and Gordon, he was able to spend many seasons as a guest on Speyside, at a time when salmon fishing and deer stalking were in their infancy as field sports. 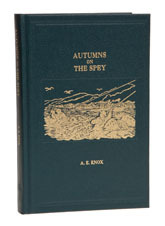 Autumns was first published in 1872 and despite becoming much-collected, escaped reprinting until recently. Quite how one of the most fondly remembered classics about Scotland’s most famous river slipped through the net is beyond me, especially given that the author lists a series of old Spey salmon patterns which can be found nowhere else. The story concentrates on a few sporting seasons spent fishing the lower beats of the river and stalking the deer which abounded in the nearby hills, interspersed with a graphic account of the Spey floods. In the late 1820s, the river breached its banks, swept away nearly every bridge in its path, slaughtered thousands of livestock and swelled to nearly two miles in breadth at one point; but in quieter times, the river remains one of the swiftest flowing and most beautiful stretches of water in Scotland, features which have attracted salmon and fishermen in equal measure. Knox’s book is an elegiac account of the days when salmon fishing was a great adventure and has deservedly brought its author a kind of immortality. This lush Medlar edition is a bargain at the price.